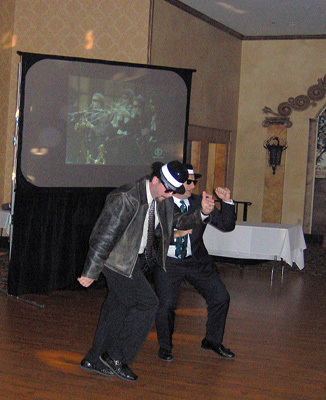 Paradise Entertainment will engage your guests of all ages...with the right mix of music and interaction! We will pack the dance floor with ease that comes from experience! Let's design the perfect reception together. Our online forms provide a stress free approach to planning all the details of your special day! We will skillfully direct the events of the night so everything runs seamlessly and with style! Imagine dancing with your husband for the first time and as the song begins, you are lost in each other as you hear your voices for the first time during the song professing your love for each other, and your messages are edited to perfection, and mastered into the first dance. You may also choose to record a message from the bride to her father for the father-daughter dance, from bride and groom to their parents or guests, the vows from the ceremony, messages from guests unable to attend, or many other variations. 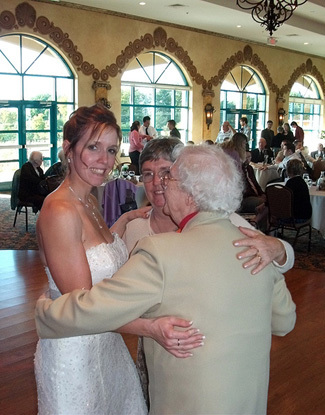 Share your love story with your guests with a customized slide show. Let Paradise Entertainment create a multi media trip down memory lane with pictures from childhood through present day, digitally mixed with music, captions, & transitions. In addition, we bring the equipment to show it. LCD Projector, screen, 47"HD monitor and DVD player. Or you can create your own presentation and we'll supply the equipment to bring it to life! Wedding and Reception Slideshows: Calling all brides and grooms to be!!! Send us pictures of your growing-up-years through your engagement and we will put together a slideshow that you can display at your wedding reception or rehearsal dinner. Father Daughter Dance: From childhood, to high school to bride, there won’t be a dry eye in the room as the bride and her dad relive their most precious moments together. Anniversaries: Show that someone special that you care in a beautiful walk through memory lane or get the whole family together and show those special occasions through the years. Birthday Parties: Send us your pictures from birth to present and we’ll put together a memorable presentation that will last a lifetime. A great package for your reception, as long as you and your guests want to have a great time! 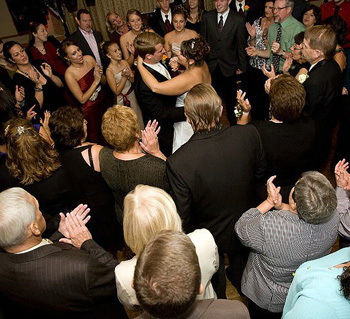 Comprehensive DJ/MC package ideal for the majority of wedding receptions to cover cocktail hour (if applicable within the time period), dinner, dancing and traditional wedding activities such as cake cutting, first dances, bouquet and garter toss, etc. Includes comprehensive and personal planning services. You decide the level of guest interaction from low key to high energy! Uplighting and monogram lighting available at discounted rate!! (Ideal for 140 or more guests) You are guaranteed that the most experienced and professional members of our staff will be at your wedding reception, coordinating the reception events and handling all the details of the night.An assistant dj/coordinator will also be on hand for maximum peace of mind and guest involvement! Includes everything in the Premier Package plus dj assistant/coordinator and dance floor lighting to bring the party to life! Uplighting and monogram lighting available at discounted rate! This is ideal for a smaller wedding (perfect for parties of less than 100 guests), or for a more intimate, cozy reception. Your emcee will also be your DJ and will coordinate the evening for you from the beginning to the end of your planning process. Your DJ/MC will play a variety of music as well as your guests' requests. Features an additional sound system, 30 minutes of music during guest arrival, all customized ceremony music and 15 minutes of background/cocktail music after the ceremony. Plus wireless microphones if requested. Assistance in planning and choosing music and coodination of events is also included. This 3 hour package is ideal for the majority of outdoor picnics, parties or outdoor public events. Included are main sound system, small dance floor lighting system, and professional/dj mc. (15 lights) Add elegant and eye-pleasing uplighting to your room or event center. Lighting shed up walls, columns or spotted onto a specific area will bring a beautiful and stimulating feel to your event $25 each additional fixture. Highly customize your uplighting experience by synchronizing lights together and computer programming their effects. Final price depends on complexity. Project your name/date/message, or logo, relevant information or just about anything onto the dance floor, on a screen, or up against a wall. Includes Design Services. If you would like enhanced dance floor lighting for special effects it is highly recommended that the lighting system be upgraded to include additional fixtures, intelligent club style lighting, etc. Additional, full wireless speaker systems for that additional sound reinforcement for large or obscure rooms or in a secondary area, foyer, outdoor patio or terrace. An additional sound system for second area of sound – typical for larger cocktail hours, additional rooms of music, special shows, etc. Video picture slide show with captions, titles and transitions all set to music. Keepsake DVD's (x3) included. A high resolution video projector for your slide show, presentation or other media event. Includes equipment Rental, Setup/Breakdown, Interface with main sound system and Operation during the show. $50 42" flat screen hd monitor.Perfect for setting up a presentation during cocktails or in the corner of a room to run during the entire reception. Paradise Entertainment accepts cash, money orders, checks or credit card. If you are paying by money order or check, please mail payment to my contact address. $200 deposit is required to reserve the date. Deposit is refundable with cancellation notification up to 4 months prior to event. Pricing depends on type of function, day of week, time of day, and type of services offered. If ceremony and reception are in split locations, additional charges will apply, typically between $100 and $150 depending on the details. Non-Weekend events (Mon-Thur) are generally at a lower rate. All pricing and costs are fully disclosed in the contract, up front.